Respiratory problems are the primary cause of underperformance in horses. They reduce muscle oxygenation capacity, which directly affects sporting performance, thus creating specific nutritional requirements in horses. The unique combination of four carefully selected essential oils has made Balsamic Air a success for more than 20 years. Its texture means it can be administered either orally or by spraying in the horse’s environment. 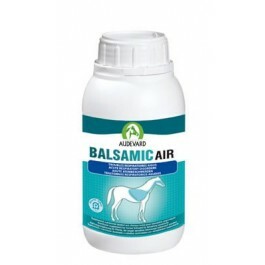 It is indicated for hygiene of the mucous membrane in the respiratory tract and for horses suffering from benign acute airways disorders. 500ml. Sufficient for up to 25 days use in adult horses. Raw materials: Sorbitol, potassium chloride. Additives: 2b - Aromatic substances: Paperbark (Melaleuca viridiflora - EO) 5460 mg, rosemary (Rosemarinus officinalis - EO) 5460 mg, eucalyptus (Eucalyptus globulus - EO) 5460 mg, Norway pine (Pinus sylvestris - EO) 5160 mg, terpineol 5152 mg, thyme (Thymus vulgaris— MT) 1,360 mg.
Analytical constituents: Humidity 96.3 %, crude protein 0.8 %, raw fats 0%, crude ash 0%, crude fibre 0 %, sodium 0.003 %. Nutritional support to meet horses increased respiratory requirements in winter. Daily allowance: 10 ml 2 to 3 times per day for 8 days. Great champions are given Balsamic Air three days before transportation and for several days afterwards if required, to minimise the unpleasant effects of a change of environment, or time spent in the confined space of a horsebox, or trailer. Immuno RS is a nutritional supplement made by AUDEVARD Laboratories. It is designed to provide appropriate nutritional support to foals and horses whose usual routine is disturbed by training, competitions, travel, etc., and for susceptible horses. Ekybleed is a nutritional support formulated by AUDEVARD Laboratories. It is designed to provide nutritional support to sport horses in preparation for increased respiratory effort. Balsamic Control is a complementary feed formulated by AUDEVARD Laboratories. It has been designed to provide additional nutrition to meet the respiratory needs of horses that live in dusty environments and young racehorses undergoing training. Equistro Respadril is a complementary feed supplement that combines a selection of plants and readily assimilated copper to support the normal function of the respiratory system in horses.